Beijing, China (BBN)-Asian shares were up despite China sending the value of its currency, the yuan lower for the third consecutive day. Thursday’s yuan guidance rate was set 1 per cent down, a smaller margin than the shock cuts earlier in the week, reports BBC. The midpoint is a guiding rate set by the government, from which trade can rise or fall 2 per cent during the day. The Shanghai Composite rose by 0.8 per cent to 3,916.68 points in early trading on hopes the lower yuan will help exports. In Hong Kong, the Hang Seng was up by 0.6 per cent to 24,048.49 points. The region’s largest stock market, the Nikkei 225 index, rose by 0.4 per cent to 20,471.13 after hefty losses the previous day. That’s despite core machinery orders falling 7.9 per cent in June, down for the first time in four months, as official data showed just before markets opened. 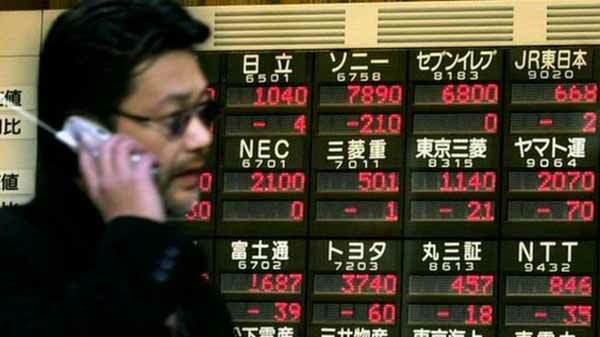 In South Korea, the Kospi index was unchanged at 1,973.98 points. Data released in the morning had the country’s July exports slightly revised down to a 3.4 per cent drop. But traders were also looking at South Korea’s central bank which after a morning meeting announced it would leave the interest rate unchanged at 1.5 per cent. In Australia, investors were more upbeat, bringing the benchmark S&P/ASX 200 up by 0.5 per cent to 5,407.00 points. Market bellwether, mining giant BHP Billiton, saw shares up by almost 3 per cent while a rise in gold prices also sent other mining companies higher.